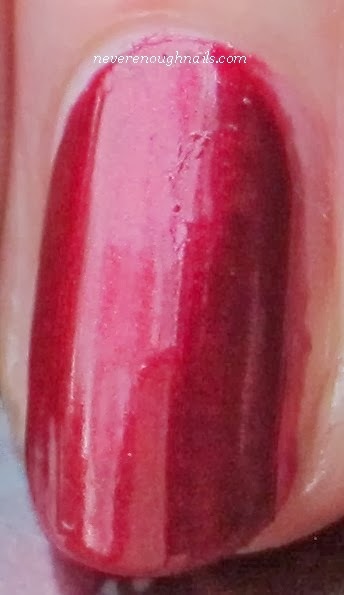 Today's post features my first Obsessive Compulsive Cosmetics polish, Black Metal Dahlia. I remember seeing swatches of Black Metal Dahlia when it first came out, but for some reason I didn't run out to grab it. Right before Christmas, I saw pictures of this on Instagram and fell really hard for it. I just HAD to get it! I got a ton of Sephora gift cards for Christmas, so I ordered it soon after. Black Metal Dahlia is THE perfect glowing cranberry polish. Slightly dark and bordering on vampy, yet clearly a rich cranberry color, I think this is my absolute favorite glowy red now. Do I have other glowy reds? Yes, but this is cranberry, people! Not red! This is two coats of Black Metal Dahlia. It was nearly full coverage in one coat, but I did a second to deepen the color. The formula was good. Once it started to pool near my cuticle on my ring finger, so just be careful not to load up the brush too much. I really love Black Metal Dahlia and it's got me eyeing the other OCC polishes! Have you tried any OCC polishes? Which ones are must haves? I grabbed this at Sephora.com and it's still available there now.